We wish a Happy Holiday Season to all and remind you that our support and sales lines will be closed from 1 pm MST on Dec 24th until 6 am on Dec 28th. MetaStock 11 is launched! Don't miss the live webinar guided tour! MetaStock 11 is here! Over 25 years in the making, the latest version of MetaStock is packed with the features that today’s traders need to be successful… including the MetaStock Fundamental Analyzer! These 60-minute webinars will show you what’s new in MetaStock 11 as well as how you can use it to make smarter, better trades. * The MetaStock Fundamental Analyzer – discover how to navigate this comprehensive library of fundamental data, and how to scan the market using YOUR fundamental criteria. * New Adaptive Indicators – learn what an adaptive indicator is, and how it provides the most responsive and accurate results. * New RMO Alerts – explore the latest additions to the wildly popular Rahul Mohindar Oscillator trading system. * New FOREX Systems – discover the "3-V" approach (Velocity, Verticality, and Volatility) and how balance between different types of indicators offers superior performance in our NEW FOREX systems. * And more – check out the new stops, new indicators, symbol utility access.... all the new features of MetaStock 11 will be covered. 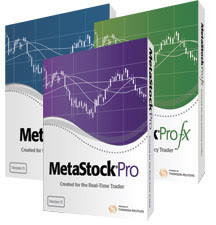 * Learn how MetaStock can find stocks that meet your trading style in any time frame. * Learn how the Explorer scans, sorts, and ranks securities based on any criteria you can think of. * Learn how to system test across multiple systems and multiple securities to lower your level of risk. * Learn how you can easily match the right trading systems with your favorite securities for the highest probability of profit. * An Expert Advisor feature that shows you where to buy and sell based on the indicators you choose. * Learn how 200 indicators such as Relative Strength Index and Moving Averages can help you know when to buy and sell. Don’t miss this opportunity to learn about MetaStock 10 from the pros! Is it time to go real time? Is it time to go real time? MetaStock End-of-Day users... if you want to go real-time.. now is the time. Upgrade before this Saturday June 20th and you get $200 off of MetaStock Pro and a FREE month of QuoteCenter Real-Time Data and Newsfeed.
" tonight at 9:00. Register to attend. This class is perfect for users to the MetaStock program and people that may be interested in the Software. In this free class you will learn. Kevin Nelson is the founder of Breakaway Training Solutions and LearnMetastock.com. He has spent the last 15 years becoming an expert on MetaStock software and a serious student of technical analysis. Prior to joining Equis International in 1993, Kevin was a stockbroker for a well-known NYSE firm. In his role as Sales Manager at Equis, Kevin interacted extensively with Metastock customers via phone, webinars, and public appearances. That experience enabled him to gain a keen understanding of the needs of technical analysts worldwide. He has spent the last three years traveling the U.S. introducing the MetaStock program to thousands of people and teaching them how to use its many features. His easy-to-understand approach is considered by many to be the best in the industry. Ever get confused when reading a price chart? Ken will share some of his most powerful yet simple tools to help you make money consistently from trading. It's crucial to properly read a price chart to evaluate the trend direction and (more importantly) trend strength. Knowing trend strength will reveal whether the trend is strong or weak, gaining strength or losing strength. This allows you to use appropriate trading strategies to trade with or against the trend. Ken will also show unique applications of "extreme" Fibonacci ratios to determine when the trend is likely to end. Proper use of these ratios will pinpoint highs and lows, sometimes within a few ticks. This applies to any and all time interval charts. These concepts will improve your trading results whether you trade stocks, futures, FOREX, or Bonds. * Dr. Elder's Trading Room add-on which contains indicators found in his books, "Trading for a Living" and "Come into my Trading Room". * Dr. Elder's Trading Room add-on has 14 unique indicators, 12 pre-built templates, 7 explorations, and 3 expert advisors to help you immediately start trading the way Dr. Elder recommends. * His latest book Sell and Sell Short which deals with planning trades and setting profit targets as well as stops on long positions, in addition to selling short – all aspects of making a trade. * A review of current markets, using Dr. Elder's Trading Room add-on for MetaStock. This blog is maintained and managed by Equis International, the makers of MetaStock software.